This magnificent property is located on Patrick Street and offers in the region of 231.96 Sq M (2496 Sq ft) over 3 floors. This is a protected structure (23-201) which was constructed using cut-stone coursed limestone and it stands out from the predominantly rendered street elevations of the surrounding buildings. The offices have been kept in very good condition, there are burglar alarms, fire alarms and security codes on the doors. The building is tenanted by two different organizations (Barnardos & The Academy of Music Tullamore). The property commands an commanding position on Patrick Street, a street which is home to a variety of business ; bookmakers, shoe shops, gift shops, mens clothing shops, female clothing shops, hairdressers, financial institution (Credit Union), chemists, auctioneers and public houses. The subject property offers in the region of 231.96 Sq M (2496 Sq ft). It is a protected structure (23-201) which was constructed in the mid eighteenth century. It is an imposing structure, it was constructed using cut-stone coursed limestone and its faé§ade makes the property aesthetically pleasing, as it stands out from the predominantly rendered street elevations of the surrounding buildings. It should be noted that the fact that the building is protected, will preclude any alterations to the front of the building, it is therefore not suitable for retail purposes. The offices have been kept in very good condition, there are burglar alarms, fire alarms and security codes on the doors. There is no designated parking provided to the tenants. There is pay and display parking available on Patrick Street and in the former Texas car park. The building is tenanted by two different organizations. 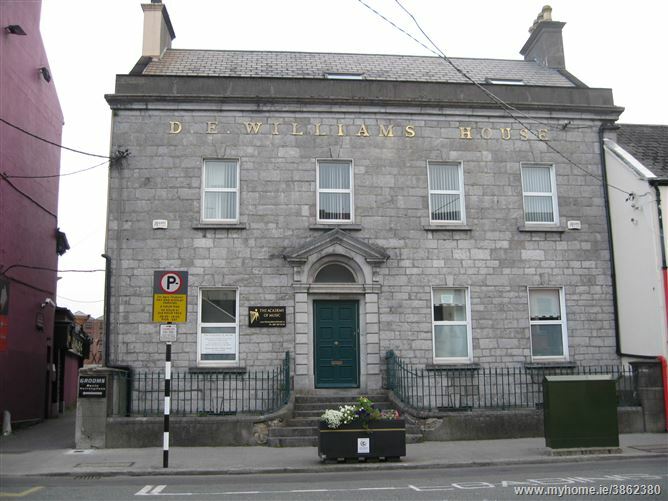 Part of the building is occupied by Barnardos and part of the building is occupied by The Academy of Music Tullamore. We are informed that Barnardos have a new 2 year agreement that was drawn up on 1st April 2013 and the passing rent is now €10,000 per annum. We are informed that The Academy of Music current agreement expires at the end of this calendar year and the passing rent is €10,000 per annum.